A2 has moved fairly on line with our predictions. It moved into the sub-continent on Saturday, and thru Tuesday, precipitated rain and snow in the Northern regions. Places like Kupwara in Kashmir got as much as 4 cms in a day on Monday. The higher reaches did receive snow, but has not restricted movement or caused any disruptions. Qazigund a south Kashmir town on Srinagar-Jammu highway recorded highest 45.8 mm rainfall till 0800 hrs this morning. However, the 300-km-long, life line to Kashmir was through from both sides. Leh recorded a minimum of 1.2c. Gulmarg received snow and the minimumtemperature on Tuesday was -1.7c. Pahalgam got heavy rain and mild snow, with the minimum skidding to 0.4c today. Other N.India Rain/snow for Tuesday in cms: Banihal 5.0, Quazigund 4.6, Bhuntar AP & Srinagar 0.7 each, Kalpa 0.6, Dharmasala 0.5, Ambala & Banda 0.1 each. A2 was active in Utterakhand today (Tuesday). Higher reaches of Himalayas today received fresh snowfall in Uttarakhand while most of the lower areas experienced rainfall bringing cold conditions in the hill state. Both the regions of Garhwal and Kumaon like Gangotri, Yamunotri, Badrinath, Kedarnath, Hemkund sahib and Chakrata received snowfall while most of the lower areas, including the state capital experienced drizzle. Mussoorie recording11 mms of rain and the maximum managing 14.2c as the high on Tuesday. In the last couple of days, Day temperatures dived by 2/4c in the plains, with New Delhi hovering around 33c as anticipated, and Srinagar moving along estimated lines at around 14/15c in the past 3 days. Shimla was 19c today. The IMD day temperature anomaly map says it all. Even the nights over a larger region of South, East-Central and East India along with NW India are below normal for this time. Seems A2 rains were heavier across the borders in N.Pakistan. Muree measured 38 mms while Quetta received 15 mms yesterday, ad many stations between 10-15 mms. The highest temperature in the day today in Pakistan was 38c at Turbat. In Nepal, rainfall was heavy in the central areas, with Pokhra guaging 24.8 mms today.Kathmandu measured 1.8 mms on Monday, and traces today. Day was comfortable at 27.6c. Comfortable, considering it was tending to shoot in the mid 30s prior to A2. N.Indian areas from Friday, 15th. thru Monday 18th. Resultantly, average day temperature could well be in the normal to below normal range for this weekend. Outlook For next 4 days: Wed13th.April - Fri 15th.April: (Next forecast for weekend on Friday night).Enlargement of Forecast map here. Precipitation in the Northern regions of Pakistan and in NW India is expected from Friday, 15th. April thru Monday, 18th April. A well defined Wind dis-continuity line, formed from the induced low (of A2). This could auger well for some thundershowers are likely to pop up from Thurs/Fri/Sat, in interior Mah. and Karnataka. Mahableshwar,Pune, Nagar, Marathwada, and all areas of Vidharbha likely to receive these thundershowers in pockets from Thursday. This development in the interiors is normal for April, but ,always better off if it is brief. It should not allow the temperatures to remain low, and should allow the heat to actually build up. IMD Daily Bulletin Quote (12th. 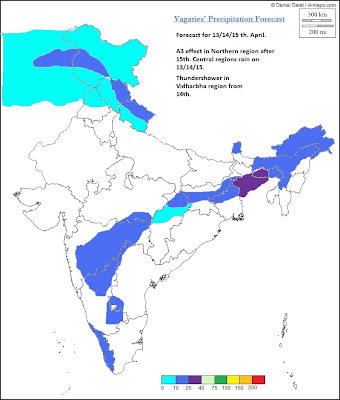 April):" A trough/wind discontinuity runs from the induced low over west Madhya Pradesh to south Madhya Maharashtra across Vidarbha and Marathwada with an embedded cyclonic circulation extending upto 1.5 kms a.s.l. over south Madhya Maharashtra". Due to a high pressure area building up and gaining in the Arabian Sea, coastal regions of Sindh (Pakistan) including Karachi, and Saurashtra region of Gujarat, India, could well expect strong gusty NW winds from Thursday, speeds gushing to 40 kmph. Partly Cloudy on Wednesday night and Thursday. Days will be warm at 33c, getting a bit more humid from Thursday. Nights will be around 25c. Scotland shivers after yesterday's 70s, Eastern Europe struggling to warm as northwest flow pushes cold Arctic air south. Amazing weather...very warm to shivering cold.....full story on Mark's blog. This morning (13th April, 8:45 local time), it has been raining since six in the morning and it seems it is going to rain some more. The temperature now is around 13C. Sorry Neeraj. It will not happen again. Thanks Rajesh ji, it seems we will have a dry day on new year (tomorrow) but a wet new year's eve.. Tomorrow is new year's day holiday here..
Do we closely track Indian ocean dipole (IOD) for the monsoon watch series, would love to get your thoughts on this. Ananth, thanks for the link..I do not consider the IOD factor for Monsoon Forecasts. My personal view is that IOD does not cover a larger view, like I saidin th MW, Monsoon currents have to be observed from the southern hemosphere, and cover wide regions. IOD is new, and again, I think not proven. I think IOD is still confusing, and do not feel the need to consider it. Anath, these are my personal views, and may be different from others' views.